Shining crystal rolling down ……. The shining crystal was rolling down at that moment……. After I finished to clean the guest room I went out and found this. This entry was posted in Meal on 2009年2月25日 by izusakuraya. I went to Shirahama primary school with my son to pick my daughter up after school today. This is a parking lot near the school. When I picked my daughter up I found this and took some photos. There are some Kawazu Sakura trees there. We had a strong wind today and it made the cherry blossom brawn down on the parking lot. My children were excited with it and running around this place. 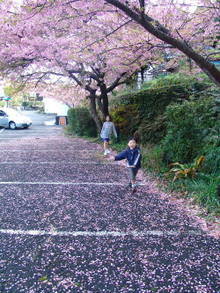 In these days Kawazu Sakura trees have green leaves after blooming.. The best season for Sakura in this region will be finished soom. 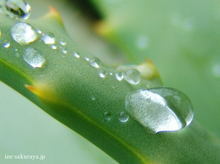 This entry was posted in Family, Flower, nature on 2009年2月20日 by izusakuraya. 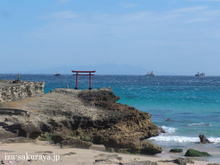 There is a Torii ( Red gate of shrine ) behind Shirahama shrine. Today I went there to take photos. But I could not open my eyes there because we had strong west wind and it brew the sand. This entry was posted in beach on 2009年2月16日 by izusakuraya. "They don’t have good wave today." This morning our guest who is surfer went to the beach to check the wave and said so. It was sunny and very warm today I went to the beach with my children after finished to clean up the guest room. I have been thinking I would like to dive in winter, but it had been very cold in these days and I couldn’t do it……. 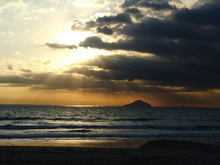 This entry was posted in beach on 2009年2月8日 by izusakuraya. Le’s go to the beach!! Today my wife went to Shimoda downtown for shopping, so my son and I had been in our pension before noon. However my son got tired of watching DVD and came to my room. "Why don’t you go to the beach today?" We decided to go to the beach by walking. 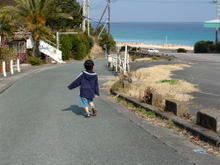 This entry was posted in beach, Family on 2009年2月6日 by izusakuraya. Today it was almost cloudy but sometimes we had sunshine. It was not cold but we had north-east wind, so we didn’t feel to go to the beach. 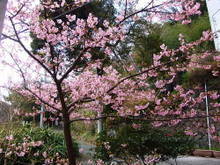 By the way Kawazu Sakura (Cherry blossom) in our garden has fully bloomed at last. We are very happy looking this tree in spite of cloudy today. Yes, we love Sakura very much. ……. This entry was posted in Flower, Pension Sakuraya on 2009年2月4日 by izusakuraya. I took this picture at 7:30 AM, the sun had alreaday rised up. The island in orange light under the cloud is called "Toshima", one of Izu seven islands. Last night the weather forcast said "It would be sunny tomorrow", but actually it was almost cloudy after noon and we couldn’t see any islands over the ocean. We were lucky we could go to Shimoda cable car yesterday. 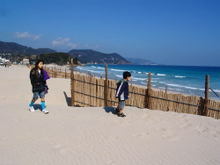 This entry was posted in beach on 2009年2月2日 by izusakuraya. Today it was very beutiful day. 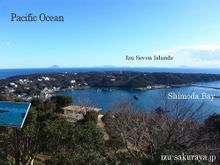 When I saw the ocean from our pension I could see Izu Oshima island clearly, so I desided to go to Mt. Nesugata-yama by Cable car with my wife and son. It’s only 3 minutes by calbe car to get to the top from the cable car station near Izukyu Shimoda station. As I was thinking we could get very beutiful senery from the top of mountain like this picture…….. This entry was posted in Amusement Park, Family, Flower, nature, Sea, Travel on 2009年2月1日 by izusakuraya.